The SC105 is a CS I/O to RS-232 adapter used to connect a Campbell Scientific datalogger to an RS-232 DCE device. Common DCE devices used with the SC105 include cellular modems, radios, and smart serial sensors. The SC105 is compatible with any datalogger that has a CS I/O port. Multiple SC105 interfaces can be connected to a single datalogger CS I/O port. The SC105 provides internal buffering that temporarily stores data. This buffering allows the data logger and DCE device to operate at different baud rates by storing the data received from the faster device until the slower device is ready to receive it. Internal buffering also ensures that no data is lost during transmission. Up to 8 mA of additional current may be used by the DCE device connected to the SC105. Three cables (13657 Null Modem Cable, SC12 CS I/O Data Cable, and 10873 Serial Data Cable) are shipped with the SC105. The 13657 cable is used to program the device via a computer. The SC12 cable connects the SC105 to the data logger, and the 10873 cable connects the SC105 to the RS-232 DCE device. An SC12R-6 cable (purchased separately) may be used instead of the SC12 cable if a longer cable is required. The 16987 mounting kit is available for attaching the SC105 to the backplate of an environmental enclosure. Note: When using an SC105 with OS version 4 or newer with a mixed-array data logger, the data logger operating system should be updated to the latest released version. Current SC105 firmware. Requires the Device Configuration Utility and a 9-pin female to female NULL modem cable. Can an SC105 be used to talk to two devices simultaneously via two addresses? The SC105 uses the RS-232 standard, which is not compatible with multidrop communications (more than two devices on the same RS-232 bus). There are some third-party devices on the market that allow multiple devices to communicate over the same RS-232 link. Both the computer’s serial port and the SC105’s RS-232 port are configured as data terminal equipment (DTE) devices. Because both components are DTE, a null modem cable is needed between them. Does a CRBasic data logger require a special interface for the CS I/O port? Depending on what equipment is being used, a special interface may be required to attach a specific device to the data logger’s CS I/O port. In general, devices with a CS I/O port can be attached directly to the data logger’s CS I/O port. Devices with an RS-232 port require a special interface, such as the SC932A or SC105, to connect to the data logger’s CS I/O port. How should an SC105 and a data logger be connected? 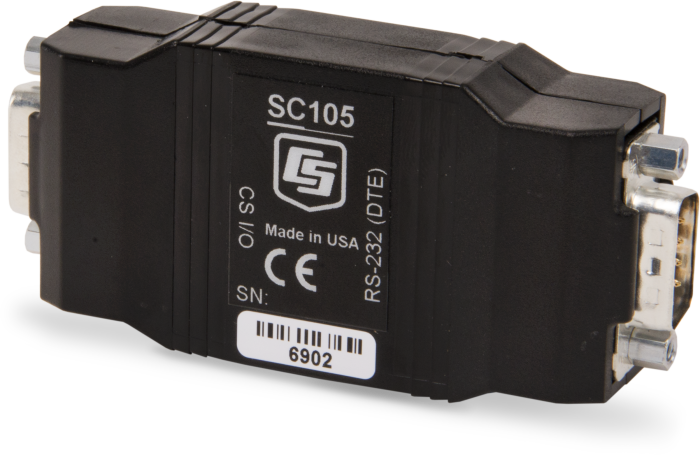 The SC105 needs to be connected to the data logger’s CS I/O port, either directly or with the included SC12 cable. The SC105’s RS-232 port needs to be connected to the PC’s serial port using the included null modem cable. Can an SC105 be used to replace a PDA to CS I/O port device? Yes, if the PDA has an RS-232 port. Why is the SC105 recommended for connecting a RavenXTV or RavenXTG to a data logger with a PakBus operating system? Using an SC105 with a RavenXTV or RavenXTG cellular modem allows for the two devices to communicate at differing baud rates. It also allows for other devices, such as an RF401 radio or CR1000KD handheld display, to simultaneously be connected to the data logger’s CS I/O port. Can an RS-232 device be directly connected to the CS I/O port of a data logger? An RS-232 device cannot be directly connected to the CS I/O port of the data logger. A peripheral, such as an SC932A or SC105, is required. What is the difference between the SC105 and the SC932A? The SC932A only is compatible with modem-enabled (ME) two-way communication between a data logger and a modem. In contrast, the SC105 is compatible with both ME and Synchronous Device for Communication (SDC) communications, as well as having the ability to internally buffer data. What is needed to connect a modem to a datalogger? Most third-party modems require a null modem cable, SC105, SC110 cable, or SC932A to interface with a datalogger. Many modems manufactured by Campbell Scientific can connect directly to a datalogger’s CS I/O port using an SC12 or serial cable.